The Condo Group is proud to announce that we have achieved the “Surfrider” level certification for the second year running from Vancouver Island Green Business Certification. Our goals as a company include reducing our carbon footprint, and we have worked hard to take care of our planet every day while we’re at work. Vancouver Island Green Business Certification (VIGBC) recognizes and promotes local businesses who are focused on reducing their impact on the environment. They cater to businesses, helping them to make their offices more environmentally sensitive; however, they also help consumers recognize local businesses who are making this a focus. To be certified, The Condo Group hosted a representative from VIGBC who toured our office and took a good, hard look at our choices and practices within our office. Items included in the checklist were building and operations, transportation, water usage, purchasing and products, waste, and social involvement. Everything we do, from the paper we use to using reusable dishes, was taken into account during the adjudication for our green status. The Condo Group has been ahead of the game in green office practices, using compost bins for all paper and food waste, and we work hard to recycle or compost approximately 90% of our waste. We love it when we find other local businesses who are choosing green, so partnering with VIGBC makes sense for us. We understand the value of our environment and that we only get one chance to keep our planet, and it is important to The Condo Group, both as individuals and as a company, to do our part to make sure we leave the planet better than we found it. 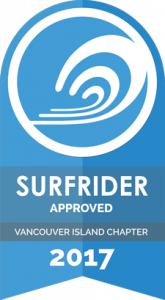 While it might not be much in the whole scheme of things, we are quite proud to once again achieve our “Green” status and receive the “Surfrider” certification from VIGBC. What are your biggest green choices you make in your household? We would love to hear them! Post a comment on our Facebook page!